Image caption David Tennant and Catherine Tate play the reluctant lovers. 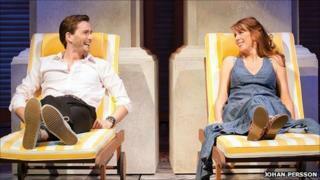 Reunited former Doctor Who stars David Tennant and Catherine Tate's Much Ado About Nothing has opened in the West End to a largely positive reception from critics. Josie Rourke's production transports Shakespeare's comedy to 1980s sun-drenched Gibraltar - complete with Rubik's Cubes and disco dance floors. Tennant and Tate portray reluctant lovers Beatrice and Benedick. The Guardian's Michael Billington said the casting "pays off superbly". Image caption David Tennant's Benedick time travels to the 1980s in this production. The production at Wyndham's Theatre comes only a few days after a more traditional take on Much Ado opened at Shakespeare's Globe to rave reviews. Billington called Rourke's adaptation "more socially specific and much sexier". His review adds: "The pairing of David Tennant as Benedick with Catherine Tate as Beatrice is a marriage that, if not made in heaven, is certainly cemented by television and pays off superbly." Telegraph critic Charles Spencer described the production as a "populist Shakespeare with both intelligence and heart". He said: "Purists will doubtless baulk, but there is an outstanding traditional production of Much Ado now playing at the Globe, and Rourke's production has a freshness and wit about it that is often irresistible. "The chemistry Tennant and Tate established in Dr Who survives in their performances as the disputatious lovers." Director Rourke loads the play's first half with a string of slapstick scenes before events take a tragic turn at the wedding of Claudio (Tom Bateman) and Hero (Sarah MacRae). Image caption Catherine Tate adopts several of her comedy voices for the role of Beatrice. Tennant, who makes his entrance in a crisp white naval uniform driving a golf buggy, is no stranger to Shakespeare, despite being best known as a TV Time Lord. He appeared in Love Labour's Lost and Hamlet in 2008. He played the 10th incarnation of the Doctor in the BBC sci-fi show until the end of 2009, with Tate as his companion Donna Noble. Among the audience on Wednesday night was Tennant's earlier Tardis companion Billie Piper. Tate, in particular, is given plenty of opportunity to use her comedy talents, although she did not win over all the critics. In his review for The Arts Desk, James Woodall said: "Beatrice should, or can, be skittish, flirtatious and unpredictable. Tate is matter-of-fact, hard-nosed and static. "She has one basic gesture, and that's finger-pointing. Her accent slews all over the place, from courtly posh to estuary - familiar of course from her screen comedy - and throughout it's as if she's just one step or chortle or guffaw away from the parody and mockery, the self-mockery, that make her TV characters so compelling." Image caption The Globe's Much Ado About Nothing - starring Charles Edwards and Eve Best - opened last week to strong reviews. His three-star review says: "This indoor, proscenium-arch account of the play fails to match - in confidence, sprezzatura, warmth of wit, or understanding of the heart - the version that opened last week at Shakespeare's Globe. A rare misstep for the admirable Josie Rourke, this production feels effortful and inauthentic." The Globe's Much Ado, which opened to a string of four-star reviews, stars Eve Best and Charles Edwards as Beatrice and Benedick and is directed by Jeremy Herrin. Much Ado About Nothing at the Wyndam's Theatre is booking until 3 September. The Shakespeare's Globe production is on until 1 October.